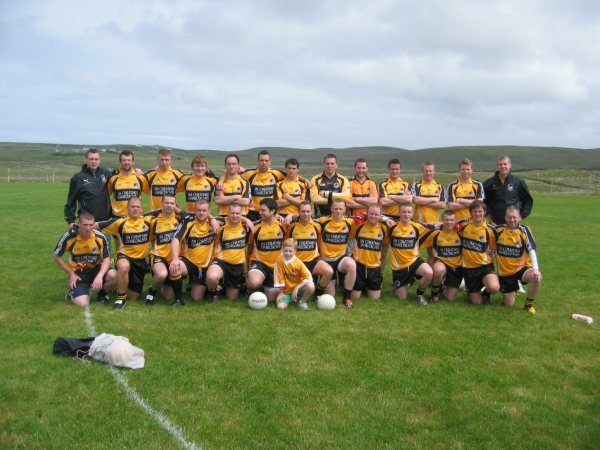 Beidh cúrsa úr glantosaitheora ag tosú Dé Luain an 22ú de mí Eanáir i nGael-Ionad Mhic Goill ag maireachtáil 6-7:30in. 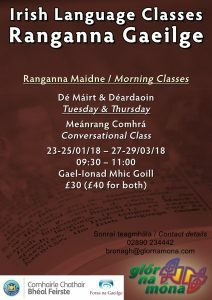 Chomh maith leis an rang glantosaitheoir úr, beidh ranganna ar leibheál bunranga, meánranga agus ardranga a reachtáil againn i nGaelscoil na Móna ag tosú Dé Máirt 23ú Meán Fómhair 7-8:30in. Beidh costás £30 ar na cúrsaí seo agus clúdaíonn seo táille an téarma agus áiseanna foghlamtha. Ar bharr sin, beidh meánrang cómhra a reachtáil againn i nGael-Ionad Mhic Goill maidin Mháirt agus maidin Dhéardain 09:30-11:00 an tseachtain dar dtús 22ú Eanáir. Bíonn na ranganna a reachtáil comhthreomhar le ham téarma. Ar bharr sin, beidh dianchúrsaí a reachtáil againn Dé Sathairn an 17ú Feabhra. Beidh an cúrsa ag titim amach i nGael-Ionad Mhic Goill agus cosnóidh sé £10 an duine le lón té san áireamh. 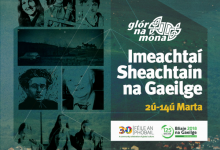 Le haghaidh tuilleadh eolais nó le chlárú do rang Gaeilge linn, gabh i dteagmháil linn ar 90 234442 nó bronagh@glornamona.com. 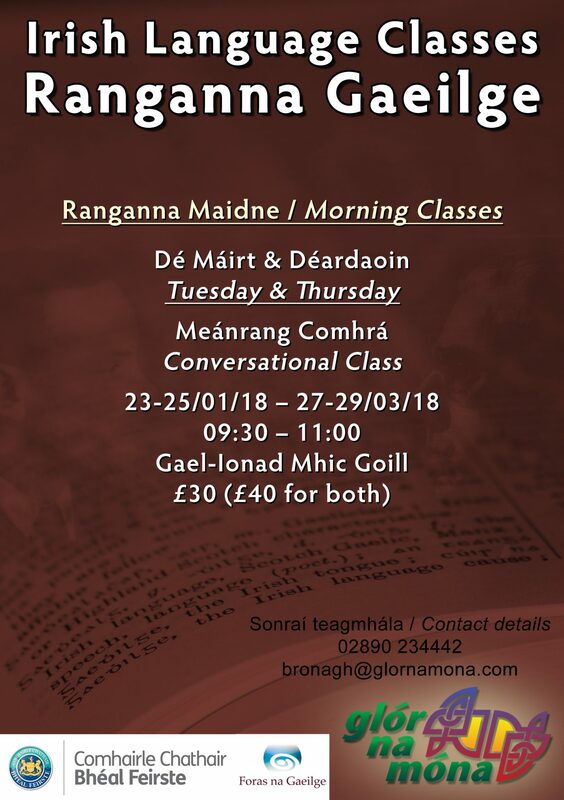 Glór na Móna are pleased to announce a new term of Irish classes starting the week beginning the 22nd January 2018 . 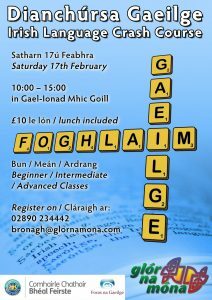 We will have a complete beginner course on Monday the 22nd January in Gael-Ionad MhicGoill beginning at 6pm and ending at 7:30pm. 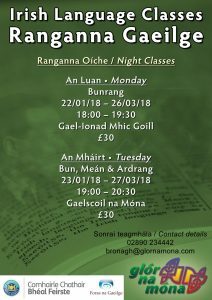 Along with the complete beginner course, we will have classes from beginner through to advanced level in Gaelscoil na Móna (Monagh Link) beginning Tuesday 23rd January 7-8:30pm. These courses will cost £30 and this covers the term fee and learning resources. Additionally, we have intermediate conversational class on Tuesday and Thursday mornings 9:30-11am beginning on the 23rd January. All classes will run correspondent to term time. 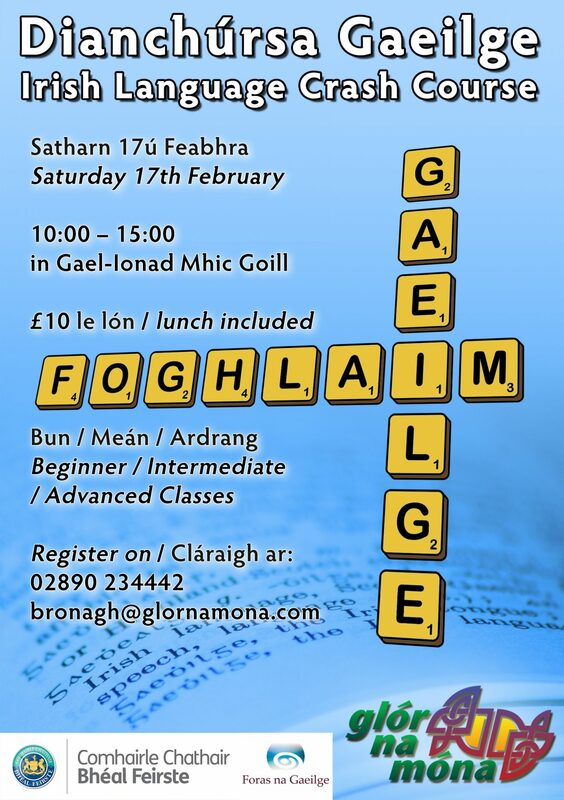 Additionally, we will have day long Irish language Intensive course on Saturday the 17th February. The course will take place in Gael-Ionad Mhic Goill and will cost £10 per person including a hot lunch. 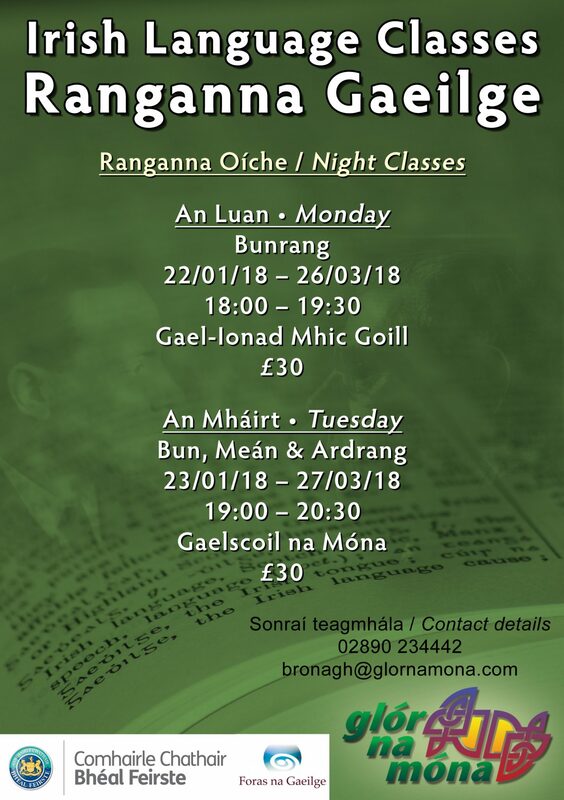 Glór na Móna organise and run further events during the year to support your development, be sure to take the first step in your journey to fluency. For further information or to register for a course, contact us on 02890 234442 or bronagh@glornamona.com .